VERY morning Johnny drove his three goats to pasture and every evening when the sun was going to bed he brought them home. One morning he set off bright and early, driving the goats before him and whistling as he trudged along. Just as he reached Mr. Smith's turnip field what should he see but a broken board in the fence. The goats saw it too, and in they skipped and began running round and round the field, stopping now and then to nip off the tops of the tender young turnips. Johnny knew that would never do. Picking up a stick he climbed through the fence and tried to drive the goats out. But never were there such provoking goats. Round and round they went, not once looking toward the hole in the fence. Johnny ran and ran and ran till he could run no farther, and then he crawled through the hole in the fence and sat down beside the road and began to cry. Just then who should come down the road but the fox. "Good morning, Johnny!" said he. "What are you crying about?" "I'm crying because I can't get the goats out of the turnip field," said Johnny. "Oh, don't cry about that," said the fox. "I'll drive them out for you." So over the fence leaped the fox, and round and round the turnip field he ran after the goats. But no, they would not go out. They flicked their tails and shook their heads and away they went, trampling down the turnips until you could hardly have told what had been growing in the field. The fox ran till he could run no more. Then he went over and sat down beside Johnny, and he began to cry. Down the road came a rabbit. "Good morning, Fox," said he. "What are you crying about?" 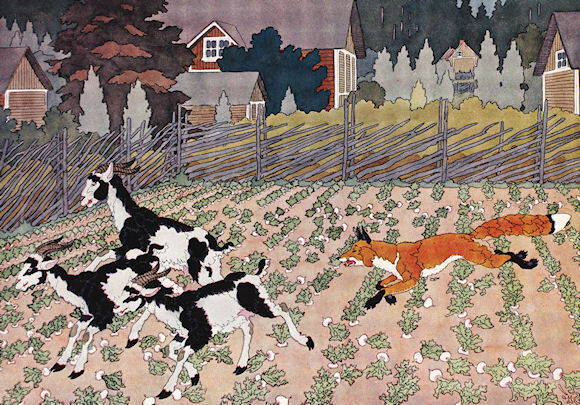 "I'm crying because Johnny is crying," said the fox, "and Johnny is crying because he can't get the goats out of the turnip field." "Tut, tut!" said the rabbit, "what a thing to cry about! Watch me. I'll soon drive them out." The rabbit hopped over the fence. Round and round the field he chased the goats; but they would not go near the hole in the fence. At last the rabbit was so tired he could not hop another hop. He too crawled through the fence, sat down beside the fox, and began to cry. Just then a bee came buzzing along over the tops of the flowers. When she saw the rabbit she said, "Good morning, Bunny, what are you crying about?" "I'm crying because the fox is crying," said the rabbit, "and the fox is crying because Johnny is crying, and Johnny is crying because he can't get the goats out of the turnip field." "Don't cry about that," said the bee, "I'll soon get them out for you." "You!" said the rabbit, "a little thing like you drive the goats out, when neither Johnny, nor the fox, nor I can get them out?" and he laughed at the very idea of such a thing. "Watch me," said the bee. Over the fence she flew and buzz-z-z she went right in the ear of the biggest goat. 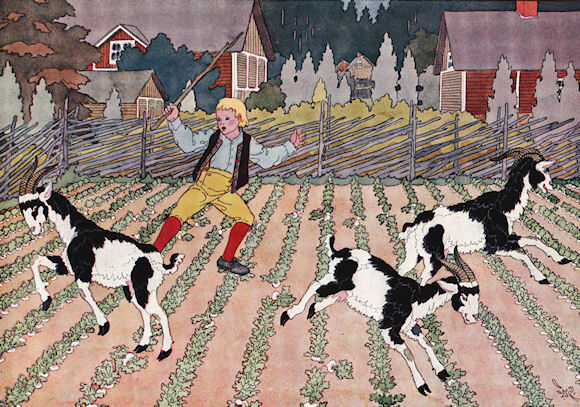 The goat shook his head and tried to brush away the bee, but the bee only flew to the other ear and buzz-z-z she went, until the goat thought there must be some dreadful thing in the turnip field, so out through the hole in the fence he went, and ran down the road to his pasture. The bee flew over to the second goat and buzz-z-z she went first in one ear and then in the other until that goat was willing to follow the other through the fence and down the road to the pasture. The bee flew after the third goat and buzzed first in one ear and then in the other until he too was glad to follow the others. "Thank you, little bee," said Johnny and wiping away his tears, he hurried down the road to put the goats in the pasture.